Gabriel’s Pantry provides food for students to help them stay focused on their academic success! 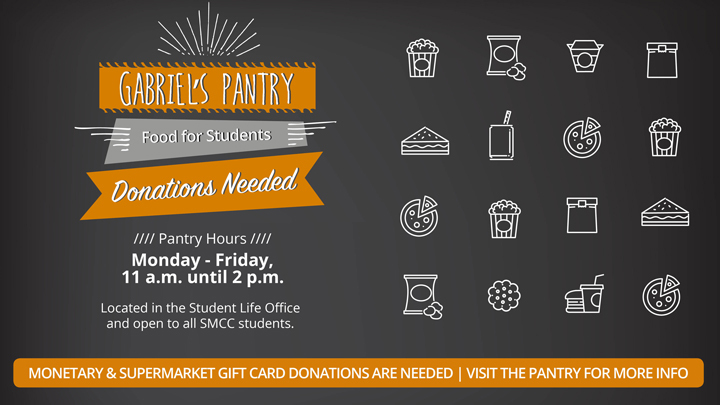 The pantry has a variety of non-perishable food items; it is located in the Student Life Office and is open Monday – Friday, 11 a.m. until 2 p.m.
Help keep the pantry stocked by donating supermarket gift cards, needed foods or cash. Monetary donations can be made at Cashiers via cash, debit or credit card, or a check made payable to SMCC- Gabriel’s Student Food Pantry.